Two weeks in a strange land, with strange customs, strange currency and strange landscapes. I may not have traveled across the globe to China or Bangladesh or deepest darkest Peru, but the two weeks I spent traveling through California with three friends was the closest I’ve come to being in another world. Despite being Canada’s neighbor, everything about it felt so different, strange and exciting. But in spite of all that, I eventually found that the place I looked forward to most was home. The moment we crossed the border, everything changed. First we were hit with a snowstorm, with giant fat snowflakes; then we saw American flags everywhere we went; then we saw palm trees; the cop that pulled us over for speeding was friendly, with a disarming southern Texas accent; and then we were told not to drink the water. And that was just in the first two days of our journey. There were times when I felt like I was on a different planet, whether it was the rolling grass hills or misty flatlands or plateaus overlooking the coast. To get an idea of how the weather was, I spent Christmas Day jogging on a beach. The people were much friendlier than I thought they would be. And for someone who enjoys biking and healthy living, San Francisco was a city built for bikes. I won’t lie: the thought of moving occasionally crossed my mind. It was really nothing more than a passing whimsical fantasy. It’s not that I couldn’t make it work—I could. I could drop it all. Live in a delightfully ratty bachelor pad in San Francisco and bike to work every day and sit in coffee shops while I write. Or maybe Long Beach, where I could jog on the beach every morning and take up wind sailing. Or Los Angeles where—actually, never mind Los Angeles. But would it be home? Home for me is Edmonton, a frozen city, and so the sight of palm trees and beaches in California made me forget what time of the year it was. Yet I found myself missing a home where it’s almost always winter. And let’s be frank: I’m someone who doesn’t even like shifting my feet to the cold side of the blanket. It was confusing: by all objective accounts I should have dreaded going back Edmonton. The weather in California was nicer, the people were friendly (sometimes moreso than Edmontonians), and the spirit of exploration followed me wherever I went. But despite the frequent call to adventure, the call of the unknown, by the time I was done my half-month trek through the United States, I was ready to go home. Despite everything wrong with it, he was still attached to his city. He wouldn’t return for nearly 10 years. Meanwhile I was only gone for two weeks. By the end of the first week of my trip, I began to feel homesick and I secretly counted down the days until it was time to go home. My friends and I drove long hours through foothills, prairies, desert and we never thought we would miss the snow. But by the time we hit Idaho, and saw the Rocky Mountains, we all knew that home was close. Crossing the border was a big event—as was seeing a Tim Horton’s for the first time in two weeks. And even as the blizzards came in and the snow began to pile up, when we finally came back into Edmonton, we knew we were where we were meant to be. This is Edmonton for you. It snows 8 months out of the year. The public transit system is confusing. If it’s not winter, it’s construction season. We have the highest crime rate in Alberta—higher if you include our house prices. Why anyone chose to settle in this icebox 200 years ago is beyond me. But this is home. Despite everything wrong with it, I’m still attached to this city. Even though we complain about the cold, we’re a hardy bunch. Our library was voted the best library system in the world, and actually managed to make libraries cool. The river valley is one of the most beautiful urban green spaces. Our festivals keep the heart warm, even if the city is in ice. The milieu of restaurants and eateries offer something for every palette. 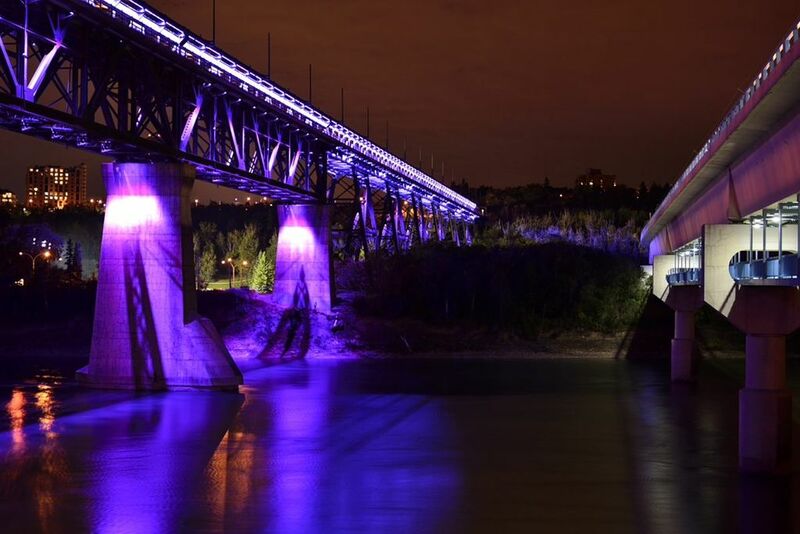 And what the city lacks in architecture, it makes up for with lights—from the glowing glass pyramids at the Muttart Conservatory to the technicolour High Level Bridge. Ever since I moved here, I feel like this is where I belong. This is where I’ve set down my roots. This is where my map was circled.